We spend almost all our waking hours glued to our computer or mobile screens for work and leisure. The worst part it, it has started seeming natural to us. 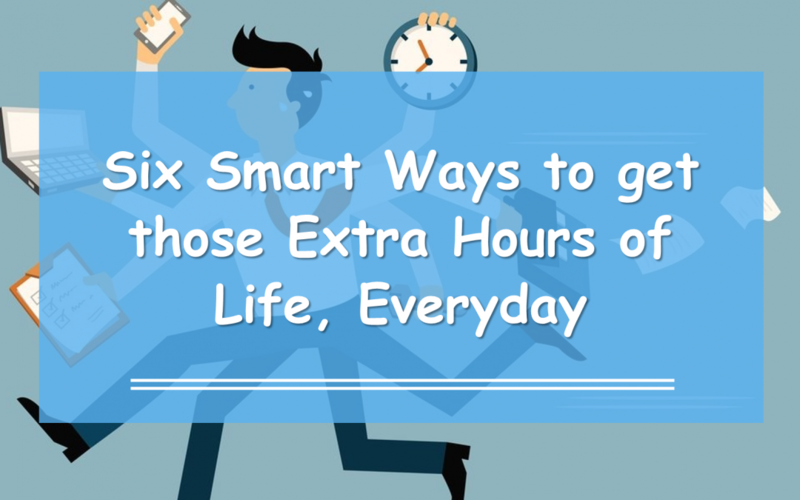 While we are apparently so busy throughout the day, a closer look at day will reveal that we do many things that can be done differently to save time for better things in life. Yes, we know that and we also know how to save time, but we just don’t! Here are a few things you should do immediately (without becoming prey to an excuse) to manage our time better. Many of these tips pertain to the Internet or usage of devices that have virtually become a part of us. As our lives get more hectic by the day, we wish we had a personal assistant to do stuff for us, saving us precious mental space and time. Taking a note, saving a useful idea, reminding us about stuff, and fishing out that important documents or quick recipe the moment we need them. Thankfully, there are many personal assistant tools that can help us save loads of time and make life much simpler. Here are five such tools you should check out today. You have stepped outside the office for a meeting without your laptop and realize in the mid of a traffic jam that you need to email a file saved in your laptop to some urgently. You drive all the way back to the office because the file HAS to be sent and hurry back for your meeting. You lose one valuable hour, and your workday just gets painfully longer. We recommend that the first thing you should do after reaching home is, download a virtual client such as LogMeln. Virtual clients let you control all your computers remotely; we believe this a great tool to access your computer any time for important stuff and save precious time in the process. Uninterrupted Internet connectivity has become a necessity for us these days. While we can do without checking our social media updates for a while, there are other critical online tools related to our work, safety and health that cannot afford to go offline. And we aren’t talking about net connectivity here! That’s hardly an issue anymore, but staying online eats up the charge in our devices power quite fast. Before you ask us what that has to do with time management, consider this. Our mobile and computer chargers have a way of going off sight just when we need them. We either was desperately at our dead device or waste a lot of our valuable time looking for the charger. Here’s the issue – we usually have one charger for our device, and we carry it around with us to work and home. Using one charger at multiple locations increases chances of it being misplacing. Here’s the hack – keep two sets of mobile and computer chargers and plug each set at a specific spot in your office and home. Also, keep a power bank handy for an emergency. This way, you can readily access your charger when your device is in urgent needs power, and never go offline! We spend a major portion of our day typing away on our mobile devices and computers. Why we cannot do away with typing, using dictation apps and text shortcuts can save us a lot of time we can spend for other better things in life! We agree that dictation apps aren’t foolproof, but they do transcribe a major portion of what we dictate. Once the text is ready in a jiffy, it’s just a matter of making tweaks in the text. Even that minor tweaking can be made easier by adding text shortcuts to our dictionary. Once you add a sizable number of shortcuts, you simply have to type an abbreviation for the type itself in its entirety. It’s no news that we frequently keep referring to Google throughout our day for that various things. Despite using it so frequently, we keep repeating one error, almost always – we simply type whatever we are searching for, and scroll away trying to locate what we want. Instead, you can use the advanced search to tell Google exactly what you want and filter down the results to save time. You will be surprised by how much time this simple trick will save you. As the Internet gets increasingly distracting, we are unknowingly spending a lot of time on things that are not our priority. Considering the fact that we are virtually always on the net, it’s important to understand how much time we spend on what online, prioritized and course-correct. Tools like RescueTime will help you do just that. Useful tips these, but only if you implement them! We highly recommend you not give in to the ‘I will do it later’ syndrome and act now to save time and make your life a lot simpler in the long run.